Ark Naturals’ patented ridge-shaped outside with toothpaste center ends brushing, and makes at-home dental care effortless! 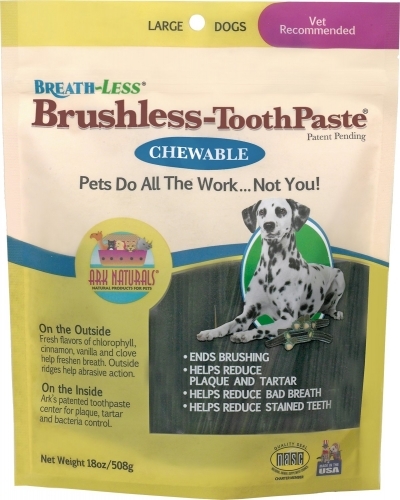 From the very first chew your pet will be on his way to fresher breath and a healthier smile. For best results, we recommend a regimen of twice a day, just like brushing your teeth! The only 4-in-1 dental care solution, this chew is an abrasive cleaner, plaque and tartar fighter, has a toothpaste center with active ingredients, and freshens breath. Available in mini size, small/medium, medium/large and large. Use with Plaque Zapper for maximum benefits.